We can be so modern and may be say Indian attire is difficult to carry on daily basis. But when it comes to choose a dress for wedding season or other ceremonial function we always prefer to go for Indian attire. One of the best Indian attire is Lehenga Choli. This dress never goes out of fashion. All Indian girls love to spend on lehenga choli and are ready to go miles to get that one best attire. We don’t mind going to that designer store far away in the city or even a market that is miles away from home and if we end up buying a piece that doesn’t make us look good on the occasion than no one on this earth can make up for our bad mood. In this writeup today I will share few tips (that I have learnt from my mistakes) on how to pick your Lehenga Choli so that you don’t make a mistake even by mistake. 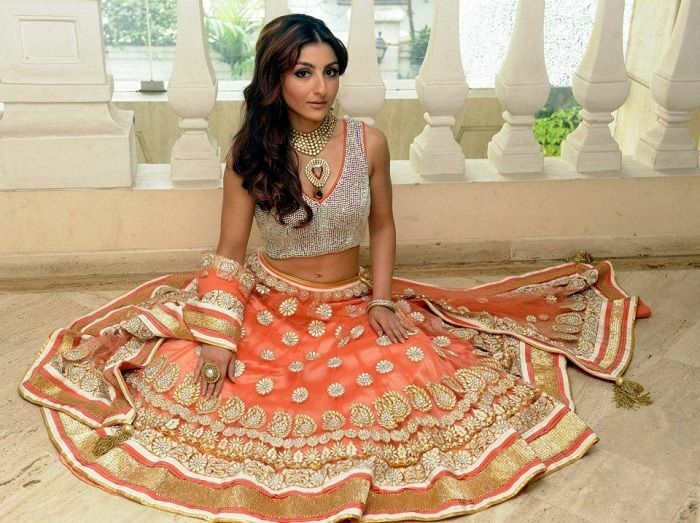 Tip No 1 – Trust me when it comes to fitting of Lehenga you have to pay close attention that it tapers to the waist and should be broader at hemline. Even if you choose the best designed lehenga in this world but the one which is broader at waist will make you look like a circus tent. A lehenga that is taper to waist not only gives you slimmer look but also makes you look taller as well. You can also opt for lehenga that is high waist. Such a piece can hide your bulges and makes you look leaner. Tip No 2 – If you have bulges on arms than you can opt for see through elbow length sleeves. That again depends upon the style of lehenga. Choli can be modified accordingly to make you look slimmer. The reason I am stressing on slimming part is that lehenga makes you look slight heavier than normal look and camera definitely adds few extra pounds. Check out the photos of your friends who have recently attended any wedding or ceremony in the attire to validate my point. Tip No 3 – Until and unless it is not your own wedding lehenga pay attention to the combination of Lehenga and Choli. If your choli has heavy embroidery than Lehenga should be comparatively plain and vice-versa. Too much detailing doesn’t go well together. Tip No 4 – You can choose colour, texture, embroidery, thread work, fabric of lehenga based on the time you are going to wear that. For e.g. If you are planning to wear this lehenga in day time than you can opt for georgette, crepe, satin kind of fabrics with light threads work and sequence. For a night function you can opt for zardosi with kaanch or resham work. You can also consider pastel shades if you have wear lehenga in an open area like a farmhouse or pool side in day time. For evening you can choose colours like red, orange, wine colour, purple and many more. Tip No 5 – If you don’t wish to spend much on lehenga but at the same time want a heavy look on lehenga. In that case you can choose a lehenga choli that has really heavy dupatta but that should be easy to drape. You can drape the dupatta diagonally with smaller pleats for a leaner, smart look. I hope that these tips were useful. Please let me know if you know any other tips by leaving your comments in comment section below.